The 2019 edition of The Legal 500 Europe, Middle East and Africa was released today. 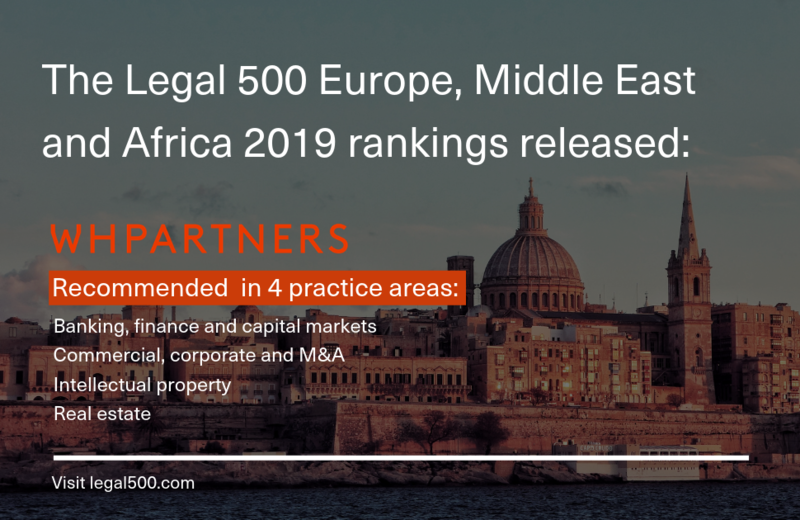 WH Partners was recommended in four practice areas in the Maltese jurisdiction: Commercial, corporate and M&A (Tier 2), Banking, finance and capital markets (Tier 3), Intellectual property (Tier 3) and Real estate (Tier 3). Partner Robert Zammit was recognized as a Next Generation Lawyer in the Commercial, corporate and M&A practice area and recommended along with partners James Scicluna, Olga Finkel and Ruth Galea. James Scicluna was also recommended in the Banking, finance and capital markets practice area together with Ruth Galea and also in the Intellectual property practice area together with Olga Finkel. Olga Finkel was also recommended in the Real Estate practice area as Legal 500 notes that she “is 'thorough, resourceful, meticulous and pays very good attention to her client’s needs'”. The Legal 500 Series is widely acknowledged as the world’s largest legal referral guide. More than 300,000 corporate counsel are surveyed and interviewed globally each year. The Legal 500 is an independent guide, in which law firms, sets and individuals are recommended purely on merit. The Legal 500 Series' analysis of law firm capabilities extends over 125 jurisdictions worldwide.